May be used for food, drinks, or merchandise, and on-line where applicable. Card cannot be refunded or redeemed for cash. Sloppy Joe's is not responsible for lost or stolen cards. May not be applied towards gratuity. SHIPPING: Gift Cards are shipped via First Class Mail and may take up to ten days to deliver. 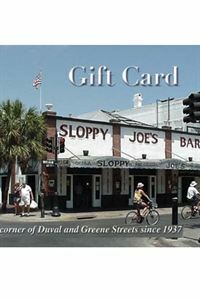 GIFT CARDS ORDERED ON OUR WEB SITE ARE ONLY VALID AT KEY WEST LOCATION. Treasure Island Gift Cards (727) 367-1600.